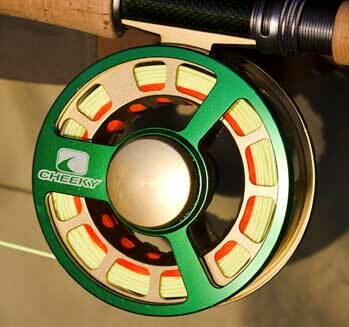 Question: I’m using a standard reel for trout fly fishing, how much backing and fly line should be on the reel? Also if you don’t have the reel loaded with enough line will this have an effect on the range you can cast? Upton’s preferred setup is a 5-weight reel with approximately 125 yards of backing and a weight-forward floating line. Answer: Knowing how much backing to spool onto a trout reel can be a tricky matter. Reels come in many sizes and arbors and there’s more variety in lines today than ever. Here are a few helpful hints I’ve learned over the years in the fly reel business. Most anglers typically spool their reel with as much backing as possible while still leaving enough space for a fly line. This approach increases the effective arbor size, speeds up the retrieve, and helps keeps line memory issues to a minimum. Keep in mind, however, there’s no reason to over-spool a reel for trout fishing. Most trout are not capable of taking a football field’s worth of line in a fight, and even if they could, many trout streams don’t offer the space for that kind of play. When I am trout fishing, I prefer to use a large-arbor reel loaded with approximately 100-125 yards of backing and a 5-weight line. Most large arbor reels will accommodate this set-up and the weight of the spooled up reel balances nicely with the newer lightweight rods on the market, a key factor in making long-range casts. Don’t forget you can always lookup the reel manufacturer’s suggested line capacity for the model reel you are fishing. There should be a line capacity table right on the manufacturer’s website or in/on the reel box. The table will tell you how much backing a reel can hold with different weight lines and what kind to use (typically Dacron in the fresh and sometimes gel spun for added capacity in the salt). Another great option is to consult with your local fly shop. Fly shops spool up dozens of reels a day and employees often have a sixth sense for line capacity. Fly shops also use a machine to wrap the backing tightly on the spool. While you can certainly spool a reel yourself at home, the tighter wrap of a machine gets more backing on the spool and helps make sure the line doesn’t wrap over itself. One hundred and twenty-five yards of backing won’t do you a bit of good if you hit a bird’s nest ten yards in.